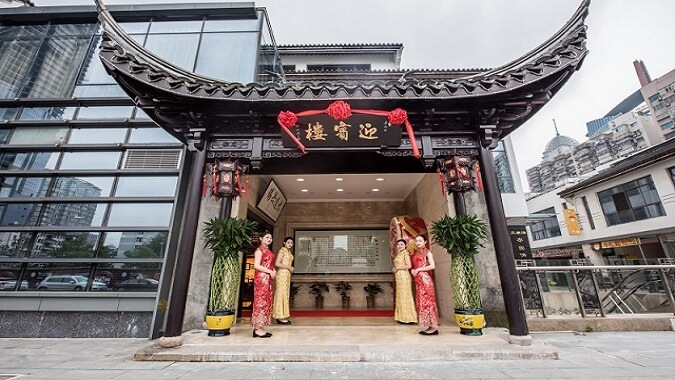 The Mirror Case Bean Curd is a traditional famous dish in Wuxi area of Jiangsu. 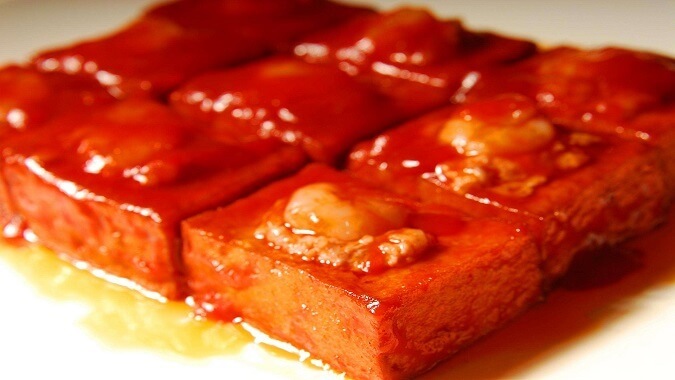 The Mirror Case Bean Curd is a traditional famous dish in Wuxi area of Jiangsu. 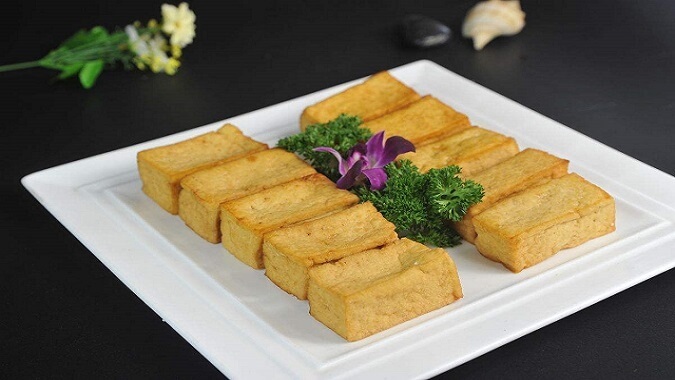 Created by the famous chef Liu Junying from Wuxi Yingbin Tower Restaurant, it is made by selecting and cooking Wuxi local featured product “minor case” bean curd. First, cut a piece of bean curd into 4, each of which is then cut into 3 small rectangles evenly (each is about 4.5cm long and 3cm wide and deep), totally the 12 pieces of small bean curd are placed in rows on the colander to drain off water. Put the pot over high-temperature fire and heat it up, then pour into bean oil and heat up to 80% hot, slide the small bean curd rectangles from the colander, fry the bean curd until it gets soft shell and shows golden yellow, and finally fish out by a colander to drain off oil. Take away some tender bean curd from each piece by a spoon handle (the bottom can not be dug through, and remain the four edges complete), then stuff meat, and then embed a big shrimp crosswise on the meat filling. The bean curd tastes very tender and fresh, as the meat looks like gold, the shrimp like jade, it is called as a case with gold inlaid of jade. 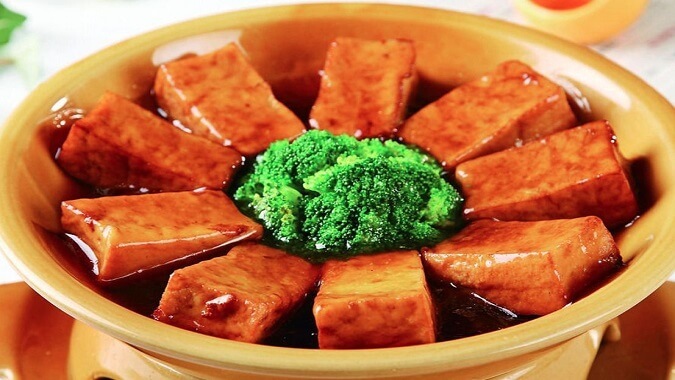 The bean curd looks like a mirror case used by women for dressing and making yp, so it is called as Mirror Case Bean Curd. 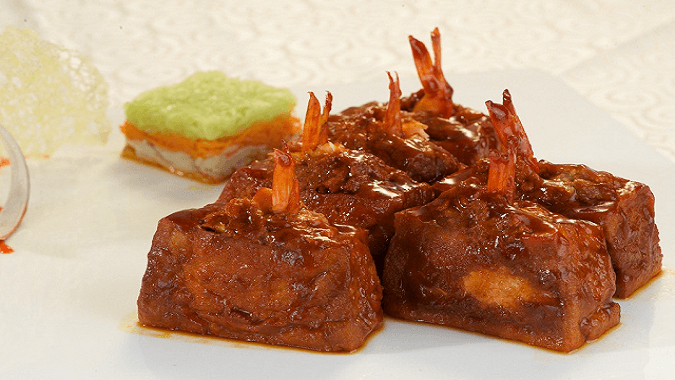 The dish is in orange, tender and delicious, combined with both vegetable and meat, and suitable for people of all ages, so it is a famous dish in Wuxi catering both refined and popular tastes.